Mid-Winter Day at Cape Evans in the Men’s Quarters, c.
During the 1880’s, blank cards were inserted into soft paper cigarette packets to reinforce them and protect the contents. 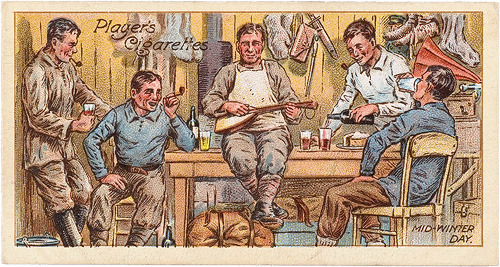 Printed advertising on the cards soon followed and interest really caught on with thousands of different sets issued by over 300 tobacco companies. Once it became popular to collect sets of cards, albums were produced to contain them. The detailed content of the cards reflect the social history of the time. Each card in a set had a different picture and textual explanation, centred around the same theme. Explore the unrivalled collection of journals, logbooks, letters, paintings, drawings and books documenting the experiences and achievements of the first British settlement in Australia in our Discover Collections.